3BR Oceanfront Condo på bottenvåningen! Vår lägenhet hyra ligger på New Smyrna Beach halvön, en 14 mil lång ö på Atlanten. Det är på bottenvåningen (inga steg) och är direkt på havet. 30 minuter till Daytona Beach och 45 minuter till Orlando. Frontage på både Ocean och Intercoastal Waterway! Vill du ha några idéer om saker att göra medan du är här? Vad sägs om dessa: Simning (hav och uppvärmd pool), Skall samling, Fiske (surf, djuphav och flod), promenader på stranden, Surfing, Båtliv (brygga över gatan vid Intercoastal), Vattenskidåkning, Tennis, Shuffleboard, Wildlife viewing och fågelskådning (Canaveral National Seashore ligger fem minuter nerför stranden !! ), Rymdfärjan lanserar (vi är 1/2 timme norr om Cape Kennedy), tre parker inom fem minuters promenad och flera golfbanor i närheten. Had a great time. Love the area and this condo. This condo was okay. It was very close to the pool. About 10 steps. It was easy to access the beach. The condo unit needs some repairs. Upon arrival the coffee table leg broke off, pantry door literally fell off and the screen doors never stayed on the track. A day later I went to recline the sofa and a big picture fell off the wall. There also was duct tape holding the glass together in the refrigerator. 🤦�🏼�‍♀️ For the amount of money you spend for this condo unit for a week....we stayed at better condo units for less. The old adage .. when it rains, it pours. The guests right before your stay reported no problems - nor did our long time winter renters who left only one week prior. We did try to address your concerns quickly and had a new coffee table delivered as soon as the furniture store could accommodate. The pantry door is being replaced as I send this, the exterior sliding screens are a constant issue as we are literally feet from the salty ocean and renters can sometimes be a bit rough (especially children); the company is there today to address the problem. I guess the icing was when the picture fell off the wall. I personally fixed that over the weekend when I returned to town. We do try to take extra care of the property so that our guests have a stress free time and want everyone to enjoy the easy access to the pool and ocean - making memories with their families and friends. Once again, I am so sorry for any inconvenience - I hope these issues did not disturb your vacation! Nothing here to dislike. This was our second visit to this unit. 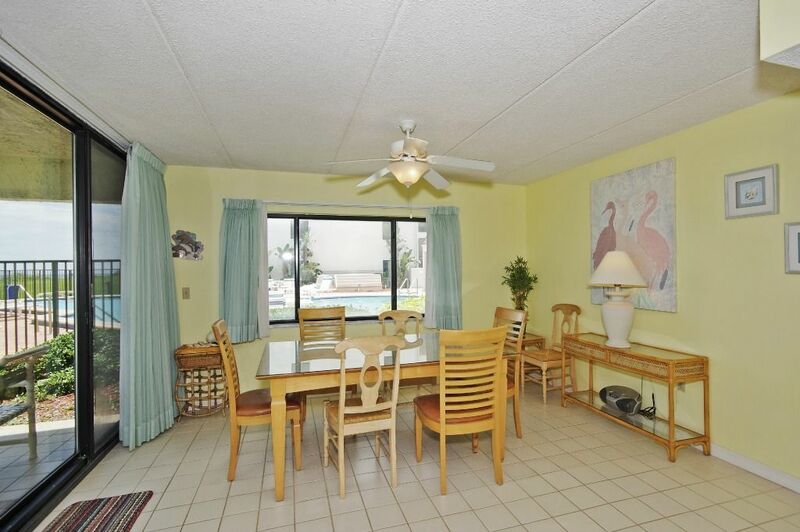 It is clean, has all the features important to us, is conveniently right next to the pool (which is heated), is quiet. We’ve noticed that many of the complex’s guests are repeat, several for 15-18 years. All of them acknowledge the good consistent condition the complex is in. Our favorite restaurant is Blackbeard, and we make sure to visit the Garlic every year. Very enjoyable, even with the hour long wait. Several ladies told us they eat at Riptide every other day, so we tried it and agree it is very good and reasonable, with no wait. We love our repeat guests! So glad you enjoyed your stay. Next time, be sure and try breakfast or lunch at one of the Wake Up Cafe's. I'm prejudiced since my daughter and son in law own them .. but you won't be disappointed! Hope to see you again! And, of course I love your return visits each year! The years do roll around quickly, so see you soon! Have a good summer! We are 2 seniors who went to NS for golfing, so the condo was perfectly acceptable for our needs. It is quite large, but is getting a bit tired. The kitchen appliances and cookware, and bathrooms, could use a bit of refreshing. And be aware that it is as far out on the point as possible, before the state park, and is about 6 miles from the village of New Smyrna. But it is right on the beach and the pool is out the door, so great it you are wanting to just hang around. There are really no outdoor cooking grills, just hibachis on a pole that don't look like they have been used recently. And the phone in the unit is now out of service, which was a problem when the cell phone service got very weak. And we got there late at night, so were a bit disappointed that there were few basics provided, such as bars of soap or paper towels. Not a big deal, but not too much to expect either. I am sorry that your experience was not up to par. We try to make improvements each season .. the most recent was painting of rooms and replacement of flooring. We will continue with more upgrades as we head into a busy season. Many folks enjoy the quieter end of the beach .. with more nature and no cars on the beach! I hope your next visit is five star! Great location and the condo has plenty of space. The location of the unit next to the pool and on the beach, and the general location of the complex, were perfect. The condo itself was spacious.